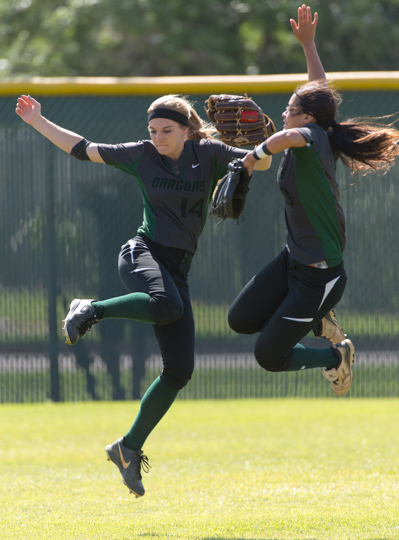 Southwest center fielder Liz Phillips, left, and right fielder Faith Aguilar contributed to Southwest's regional championship. Phillips drove in three runs and threw out a runner at home plate. Aguilar made a running catch for the game's final out in Game 3. ALREADY QUALIFIED: East Central (21-4, 9-3), Highlands (14-10-1, 11-2), Holy Cross (14-9-1, 7-0), South San (22-2, 11-0), Southwest (16-9, 10-2). LIKELY QUALIFIERS: Brackenridge (12-12-1, 10-3), Edison (14-11, 9-4), Kennedy (13-11, 10-3). POSSIBLE QUALIFIERS: Burbank (13-11, 9-5), Harlandale (7-17, 2-6), Lanier (11-10, 6-7), McCollum (10-12, 2-6), Southside (13-15, 2-6).